I was introduced to Daniele Rosti and his expressive wines by John Fodera via the wonderful world of Twitter. 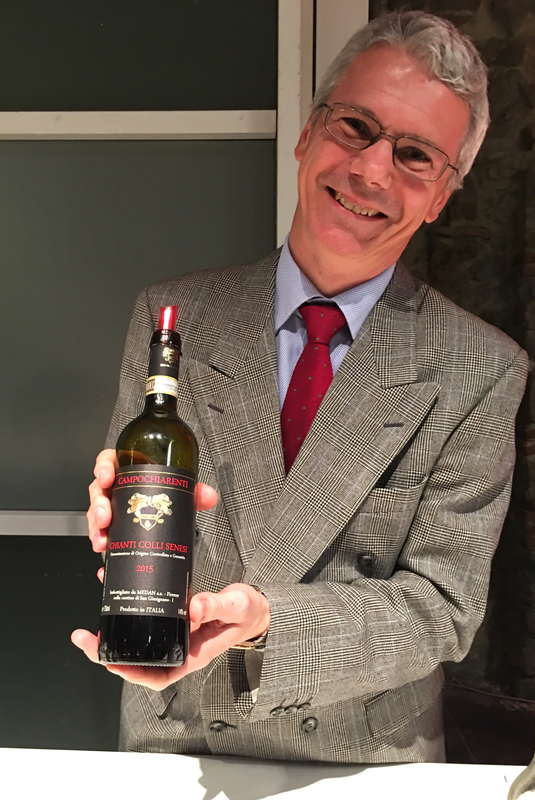 When John saw my tweets from the Chianti Lovers event in Florence, he advised that I go to the Campochiarenti table and meet his good friend, winemaker Daniele Rosti. Elegent and refined, just like his wines, it was a delight to speak with Daniele about his family estate. For all of those interested in the day-to-day trials and rewards of cultivating grapes, his Twitter account, @campochiarenti is a must follow. The knowledgable and friendly Daniele Rosti of Campochiarenti. Estate: Located in the Chianti Colli Senesi region in the Tuscan hills, the Campochiarenti estate traces its history back to the end of the 10th century when the church of Saint Nicholas along with its monastery was built. About a thousand years the later, the Rosti family purchased the 50 hectare [123 acre] estate and revitalized the vineyards and buildings. Today 14 hectares [34 acres] of the estate are organically farmed vineyards, with vines between 10 and 40 years in age. Chianti Colli Senesi and Vernaccia di San Gimignano are the main wines produced by the estate, so it follows that Sangiovese and Vernaccia di San Gimignano are the main grapes grown. However, there are quite a range of other varietals cultivated, such as Ancellotta, Cabernet Sauvignon, Cabernet Franc, Malvasia Nera, Merlot, Malvasia, Pinot Bianco, Pinot Nero and Pinot Grigio, which allows Daniele to create terroir driven wines outside of the typical framework of the region. 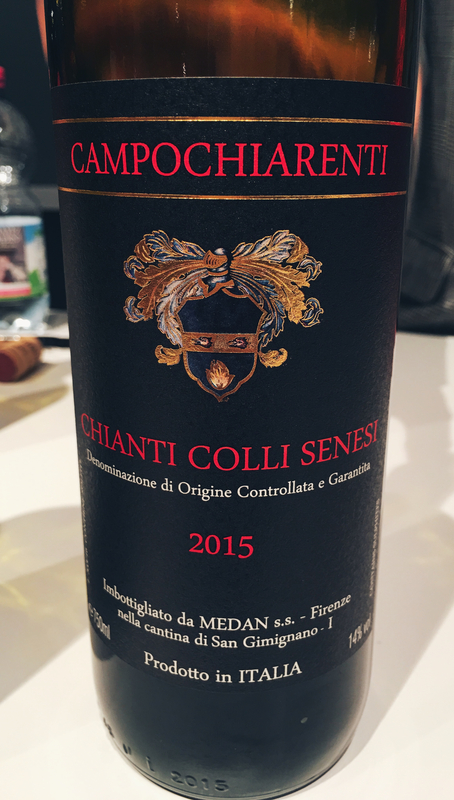 Winemaking: The Chianti Colli Senesi wines are a blend of 85% Sangiovese along with a blend of 15% of grapes that are a “typical variety of Tuscany” [Caniolo Collina, Colorino, Canaiolo, Ciliegiolo, Mammolo, Foglia Tonda]. Traditional fermentation in concrete tanks with long maceration on the skins, aged 9 months in large oak barrels in addition to a minimum of 4 months in the bottle. Although young, this already has a complex, espressive character. Silky layers of red fruit, earth and anise, culminating in the distinctive salt and pepper spice, dry finish. Complex yet so versatile, this can pair with just about every dish. Genteel and refined, with cherry, blackberry, plum, tobacco and a hint of floral. The distinctive salty spice of the estate’s terroir lingers between each sip. Soft tannins provide the backbone, whilst it is a powerful wine, it is elegant. 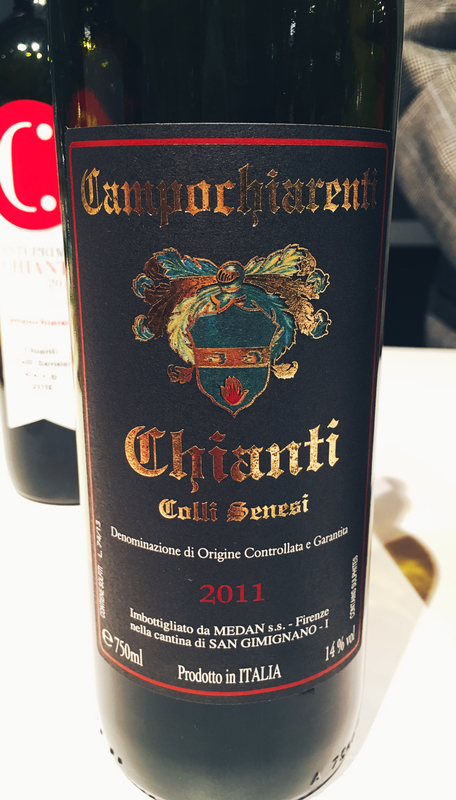 At 6 years old, the colour is still ruby red and the fruit level is very high, Daniele says that this has yet to reach its peak, and will continue drinking well 5-10 years more. Media event sponsored by Consorzio del Chianti.